In reality, modulators are used to modulate the signal-generating and processing components of subtractive synthesizers. Simply put, “They are various types of settings that can change and alter a sound.” So says Rob. And he should surely know! It stands to reason, therefore, that RP-AMOD allows users to employ its modulators to alter audio in different ways. As such, Rob Papen has included classic audio modulation effects like chorus, ensemble, flanger, phaser, and tremolo in RP-AMOD and allowed them to be tempo-synced to DAW-recorded music. Moreover, two effects (AUDIO MODULATE 1 and AUDIO MODULATE 2) can be simultaneously applied with various routing options. In typical Rob Papen style, these routing options are not only available in serial and parallel, but the audio signal can be ‘filter split’ prior to entering either of the two effects! Eminently flexible, then, RP-AMOD can be used to spice up vocal tracks, enliven instruments, or even beef up drums and loops. Let your ears decide what works best. 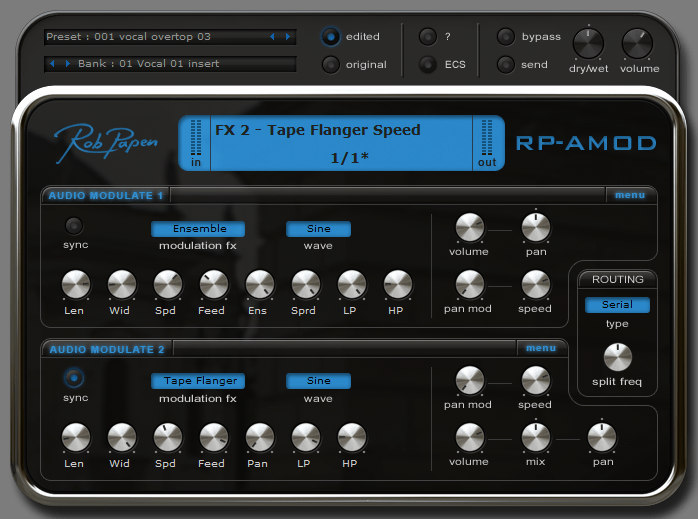 But best of all, RP-AMOD is available for free to anyone who has registered one or more Rob Papen plug-ins (AAX, AU, or VST) — simply login to your Rob Papen account, click on the My Products tab, click on the Get deal button, and a RP-AMOD serial number will soon be winging its merry musical way to you via e-mail while RP-AMOD appears as a product in your My Products list. Lastly, modulate to your heart’s content! The best things in life are free, after all.